On the heels of Pope Francis’s triumphant visit to Brazil for World Youth Day, the humble pontiff is reinvigorating the Catholic Church after a time of scandal by reaching out, advancing reforms that threaten powerful special interests and leading by example. Gone are the palatial apartments, ideological rigidity and red Prada slippers. In its place is a re-emphasis on heart and humility, a principled populist simplicity befitting the first Jesuit in the office. Perhaps not surprisingly, the neophyte pope—not even six months on the job—seems popular with everyone except perhaps the right wing of his own church. And it occurs to this political columnist that in the example of Pope Francis there might be some useful lessons for the modern GOP as they seek to reinvigorate and rededicate their own institution. 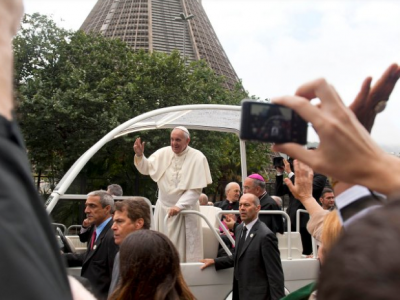 In contrast, Pope Francis is the ultimate outsider, the first South American pontiff in centuries, reflecting and embracing the demographic changes transforming the Catholic Church. He is an unapologetic believer in building a big tent, telling bishops in Rio, “We cannot keep ourselves shut up in parishes, in our communities, when so many people are waiting for the Gospel. … Let us courageously look to pastoral needs, beginning on the periphery, with those who are farthest away, with those who do not usually go to church.” This is a pope who remembers what so many self-styled conservatives often forget: that the essence of evangelism is winning new converts. And while Pope Francis is conservative by any measure, in his first months he chose not to speak out about the church’s positions on polarizing social issues like abortion or gay marriage. Instead he has emphasized core elements of the social gospel like combatting poverty and ministering to the sick and downtrodden. He has washed the feet of women—including a Muslim woman—who were in prison. This upends the status quo that passes for church tradition and upsets some conservative theologians, but expresses a transcendent commitment to compassion that gets widespread attention. The new pope has also fearlessly called for reforms within the Vatican, cleaning house at the Vatican bank and seeking to finally root out the horrific sexual scandals that have stained the church’s reputation. But what does any of this have to do with the Grand Old Party? Much of the modern Republican Party is seems content preaching to a smaller and smaller choir. They seem, unfairly or not, more concerned with the head than the heart. Absolute faith in the power of tax cuts takes the place of alternative plans to alleviate poverty or expand the ranks of the middle class. This is not just a problem with communication; it is a problem with policy content that appeals outside the base. Ironically, by way of etymology, it is often forgotten that the word “republican”—with a lower case “r”—was often used during by the founding fathers to refer to a rigorously modest, man-of-the-people approach to political office, in contrast to the high-priced puffery and pretensions of the monarchist alternative. In this as well, Pope Francis’s disdain for the tempting trappings of his office are instructive. Looking forward, the Republican Party needs happy warriors who actively reach out beyond the base at the considerable political risk of angering social conservatives. They need to express alternative policy plans for helping more people rise out of poverty and grow the middle class—and that entails more than simply demonizing Democrats and reflexively calling such concerns “socialist.” It requires confronting institutional problems and influential intra-party special interests in favor of facing facts. In a remarkably short time, Pope Francis has reinvigorated his office by upending the status quo while refocusing on the core message of Christianity, and he has done so through the power of his personal example. Of course, presidential candidates are not popes, and a political party is not a church. But beyond the realm of theology, there are powerful political lessons to be drawn from Pope Francis’ inspirational first few months. This entry was posted in Featured Columns and tagged Republican Reformers, The Daily Beast. Bookmark the permalink.